In 1923 J. Spencer Love founded a textile company located on the outskirts of Burlington. Love and his father contributed $50,000 worth of machinery from a previously owned mill and $200,000 from the sale of its real estate, while Burlington citizens subscribed to an additional $200,000 worth of stock in the new company. Early in 1924 construction began for the first mill, the Pioneer Plant, and for a village of 70 houses known as Piedmont Heights. The success and rapid expansion of Burlington Industries is closely associated with rayon. Love's was one of the first American-owned mills to produce rayon, which saw spectacular growth in the post-World War I fashion revolution. Originally known as artificial silk, rayon was the only synthetic fiber then available. Rayon bedspreads, one of the earliest fruits of Love's experimentation with the new synthetic, became a huge seller. By 1928 four additional mills in the Piedmont Heights area and new wide Jacquard looms were producing rayon upholstery goods, draperies, bedspreads, and dress goods. In 1929 Burlington Industries engaged its own selling agent in New York, thereby establishing more direct contact with its customers. With a commitment to the modernization of plants and machinery, the company expanded during the 1930s by acquiring mills that had been closed during the Depression. The corporate headquarters was moved to Greensboro in 1935, and two years later, following reorganization to consolidate the various associated companies, stock in Burlington Mills was listed on the New York Stock Exchange. A pioneer in the production of synthetic fabrics, Burlington Industries produced a variety of goods, such as nylon parachute cloth for the federal government during World War II. The company was a leader in the process of forward integration, converting its products into finished goods. When Love died in 1962, Burlington's manufacturing operations included more than 130 plants in 16 states and 7 foreign countries, employing approximately 65,000 workers. 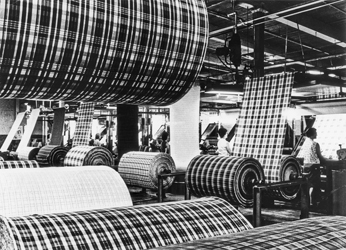 Burlington Industries remained one of the largest and most diversified manufacturers of textile products in the world at the end of the twentieth century. Its close connection with the high-tech Nano-Tex, L.L.C., beginning in 1998 allowed the company to create and use new fabrics in its products as well as improve older ones. Its products included synthetic yarns, denim fabrics, cotton and cotton-blend knits, wool worsted fabrics, and fabrics for draperies, upholstery, mattress coverings, and carpets. However, the economic struggles affecting the textile industry in North Carolina, struggles rooted mainly in the adoption of various trade agreements that led to a massive increase in foreign imports, caused Burlington Industries to declare bankruptcy in 2001. In March 2004 the company was bought by New York financier Wilbur L. Ross, becoming, along with Cone Mills (also in bankruptcy), a part of the massive International Textile Group, headquartered in Greensboro. Peter Wood, Southern Capitalism: The Political Economy of North Carolina, 1880-1980 (1986). Burlington Industries website: http://www.burlington.com/ (accessed November 13, 2012). "J. Spencer Love 1896-1962" North Carolina Highway Historical Marker Program. http://www.ncmarkers.com/Markers.aspx?sp=search&k=Markers&sv=G-126 (accessed November 13, 2012). "Burlington Industries, World's Largest Textile Producers Today." The E. S. C. Quarterly 17. No.1-2. Winter-Spring 1959. p.56-59. http://digital.ncdcr.gov/u?/p249901coll22,451973 (accessed November 13, 2012). Burlington Industries, Inc. J. Spencer Love, 1896-1962: [the Spencer Love story]. Burlington, N.C.? : Burlington Industries?]. 1962. "Love." "Burlington Industries, World's Largest Textile Producers Today." The E. S. C. Quarterly 17. No.1-2. 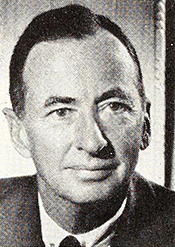 Winter-Spring 1959. p.56. http://digital.ncdcr.gov/u?/p249901coll22,451973 (accessed November 13, 2012).